If your goal this year is to lose weight, the friendly folks at city hall want to help. From Newark, N.J., to Oklahoma City and numerous points in between, city officials are offering websites, tips and incentives to help residents get fit. Philadelphia residents also can turn to a city website for help shedding pounds. The Food Fit Philly site features videos, answers questions and offers health tips, including text messages direct to phones or other devices. In October Newark Mayor Cory Booker launched “Let’s Move! Newark,” part of First Lady Michelle Obama’s “Let’s Move!” campaign to reduce childhood obesity. The Newark effort included 1,500 high school freshmen who wore devices to measure their physical activities at home and in school. Incentives included free professional basketball tickets for winners and a free concert for all participants by Bronx recording artist Fat Joe, aka Joseph Cartagena. Barringer High School beat out four other Newark schools to win the overall competition, with 619,000 total minutes moved. East Side High freshman Samantha Oliveira got individual first place honors, racking up exercise minutes by jumping rope and walking at a park near her home. In nearby New York City, in 2010 officials released the 135-page Active Design Guidelines with detailed suggestions on how to construct buildings that encourage exercise and mobility, including making stairways attractive, according to The New York Times. The first building incorporating those guidelines opened last summer and includes a stairway with lime-green railways, wall art and piped in music, all to make taking the stairs inviting to residents. Further south, Miami City Commissioner Marc Sarnoff was stunned in 2009 when Men’s Fitness magazine named his town the fattest city in America. 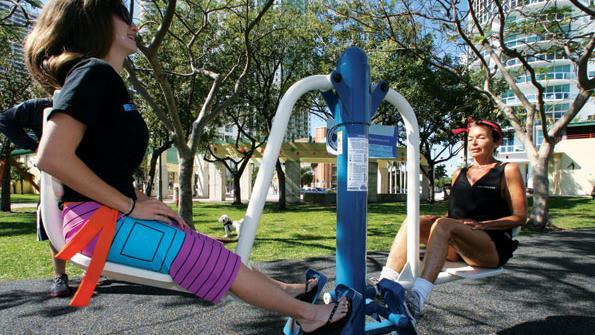 Sarnoff used city quality of life funds to buy outdoor workout equipment for three parks in his district. “The only things I remember getting from government are garbage cans,” Sarnoff told CNN.com.